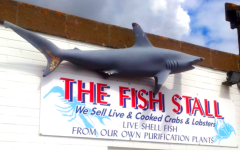 “The Fish Stall at Mudeford Quay is one of Dorset’s premier fresh fish stockists and distributors”. Our shop is open seven days a week and we deliver free of charge anywhere within a twelve mile radius. 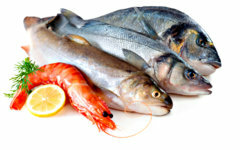 With a range of fish produce covering virtually every variety of seafood, there will be something for all tastes and occasions. Customers can also choose from a variety of live crabs and lobsters in the shop’s tanks, all of which are prepared and arranged before delivery. Such is the quality of the local and imported fish supplied by The Fish Stall that our seafood is constantly being requested by local restaurants, hotels, pubs and guest houses as well as catering companies for both everyday use and special occasions. 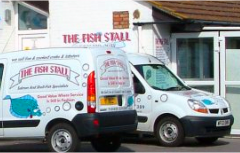 Over the years The Fish Stall has built up a comprehensive scheduled delivery round. Three days a week (Wednesday, Thursday & Friday) our delivery drivers head out to a variety of locations across Dorset, Wiltshire and Hampshire, encompassing an approx. area of 15 miles radius from our stall. Although our staff may disagree, we are not quite “Open all Hours! though it certainly seems like it throughout the summer season when we’re open from 6 in the morning until 8 in the evening! Weather too can be a great influence on our opening hours too. Being situated on the quayside we’re at the mercy of the elements, and sad to say, foul weather does come into effect. If you’re planning a visit and there’s stormy forecasts, please call us prior to your visit to check if we’re open. Check the Local Weather Forecast here.